Apple's fight against an ongoing "error 53" lawsuit came to an end today when a U.S. district court judge dismissed the case and declared that the plaintiffs "lack standing to pursue injunctive relief" and have not been able to prove permanent data loss. Apple's error 53 woes began in February, when the media picked up a story about an ongoing "error 53" message that was permanently bricking iPhones. As it turned out, Apple had implemented a feature that disabled the iPhones of customers who had unauthorized repairs on the home buttons of their devices. Non-matching repair components or damage that affected the Touch ID fingerprint sensor caused an iOS device to fail a Touch ID validation check because the mismatched parts were unable to properly sync. The validation check occurred during an iOS update or restore, and when failed, Apple disabled the iPhone, effectively "bricking" it in an effort to protect Touch ID and the related Secure Enclave that stores customer fingerprint information. Apple eventually said the error 53 bricking issue was meant to be a factory test that should not have affected customers. Just days after the error 53 news began circulating, Apple was hit with a lawsuit seeking $5 million in damages and a repair program for affected devices. Plaintiffs accused Apple of false advertising and failing to warn consumers about the security features that ultimately rendered their iPhones inoperable and caused data loss. Following the lawsuit, Apple released an updated version of iOS that restored iPhones and iPads affected by error 53 to working condition and prevented it from happening to additional devices. Apple also reimbursed customers who paid for out-of-warranty replacements for their devices and ensured all affected customers had working devices. In May, Apple filed a motion to dismiss the lawsuit based on its fix and reimbursement efforts, but the plaintiffs continued to argue that Apple hadn't done enough to warn customers and hadn't made it easy enough to get their devices fixed. Those arguments fell on deaf ears, as the judge did indeed grant Apple's dismissal motion, dissecting all of the plaintiffs' claims and rendering them unsuitable for the continuation of the lawsuit. One of the main claims was data loss, but the plaintiffs were not able to prove data loss separate from the error 53 malfunction, nor were they able to prove Apple was aware of the error 53 defect to support claims of false advertising. But the mere fact that a company has designed a product doesn't mean it automatically knows about all of that product's potential design flaws. The plaintiffs in the case will be able to amend their claims to address the issues raised by the judge, so the lawsuit may be reconsidered in the future. Purely a greedy lawsuit. Apple repaired the software problem restoring the devices to working order with no data loss, and reimbursed affected customers for the cost of repairs. And they want more? If all software had that kind of support, we'd be in tech heaven! "Why is my phone not working? All I did was install a screen that was probably manufactured by a third party in China! Let's all sue Apple!" Why should that stop the phone from working at all, in particular when it was working fine prior to an iOS update? I don't know, same reason why anything can go wrong when you install something 3rd party and not certified. It's not like Apple engineers sat in a room and said "let's punish these people who install 3rd party screens". Apple shouldn't "fix" error 53. That's what you should get when you go to unauthorized repair centers, that's where stolen iCloud locked "for parts" iPhones sink. Heh. Other people are not so willing to give up their consumer rights. In the US, at least, warranty law allows you to use third party parts and not be punished for it by the original manufacturer. That's whey we can add memory to our laptop, or different wheels on our car, without voiding the warranty. Obviously the manufacturer does not have to cover those third party parts, but neither can they disable them or tell you that you cannot use them. Another hate rant on Apple using a ridiculously flawed arguement, again. So if I get a fuel pump for my brand new Toyota from a third party, installed by a third party, and the car doesn't start, its Toyotas fault? Yeah, not one of your best attempts at having a veiled swipe at Apple, again. What is your beef with them anyway? Hating on Apple won't help you have a happier life you know. Oh no. What will all the people who said Apple should pay up for this huge issue they created do now? This was all explained in detail last time around. When iOS installs it checks the hardware to make sure everything is OK and secure. The screens were replaced with a Touch ID sensor that wasn't properly paired to the iPhone which caused the bricking. All Apple is guilty of is being extra careful when installing iOS software updates. Warranty law has a bit more nuance than that. The typical warranty covers defects in workmanship and materials. The workmanship performed by the manufacturer (and authorized agents of the manufacturer), the materials provided by the manufacturer. If the manufacturer provides for user-serviceable parts, then replacement of those parts doesn't void the warranty. However,as you noted, the manufacturer normally includes a statement limiting its liability for damage done by the use of third-party parts. Damage done while replacing those parts is generally considered product abuse, unless it's clear that the manufacturer's design contributed to the damage. If the product is marked, "no user-serviceable parts," then unauthorized service voids the warranty. Consumer law may demand that certain parts be user-serviceable, but I know of no consumer law that requires that all parts be user-serviceable. If your Mac has RAM slots, Apple does not require you use Apple RAM. However, they do state that the machine may have to be restored to factory condition as part of the authorized repair process - they need to be sure the problem is not related to that third-party RAM. In the case of user-serviceable parts, the law generally allows for third-party parts. But if the product is damaged by that third-party part, the consumer's recourse is generally with the maker of that part, not with the original manufacturer. Apple agreed that there was an error in bricking the devices, and they made good. They were not out to punish anybody. However, an incompatible part is an incompatible part. 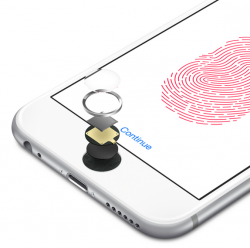 In the case of the Home Button/Touch ID sensor assembly, compatibility is tied to the device's security. Can Apple be sure that Touch ID is a secure process (and provide that sensor access to the the secure enclave), without safeguards? By all means - replace the Home Button with anything you choose. Just don't expect that Touch ID will also work. If Toyota put code in the ECU that refuses to let the engine start unless you use a specific "authorized" fuel pump, then yes, Toyota might have some liability here since it's an artificial restriction and not something that just didn't work for accidental reasons. This would be even more the case if it used to work, but then Toyota installed an ECU software update that started enforcing the usage of genuine Toyota fuel pumps. This isn't the case of something just randomly not working because of some incompatibility; this was a deliberate piece of code that bricked the device. Apple did issue an update that fixed it, though, so after that the lawsuit was moot and it was right to dismiss it. Agreed, usually I am quick to be disappointed by Apple, but in this case Apple handled it well. Released an iOS update to fix "bricked" devices and also reimbursed customers. That seems more than reasonable to me. The particular issue was the phones being "bricked" in relation to that error after an iOS update, which wasn't supposed to happen, and which is something that Apple ended up fixing (in another iOS update).